Geraldine Brady was remembered as a loving mother, grandmother and great-grandmother. Family and friends of Geraldine Brady gave a round of applause to four strangers who showed up unexpectedly to her funeral in north Toronto on Tuesday. They were with Brady in the moments after the April 23 van attack that took her life. TORONTO — Friends, family and strangers came together at a north Toronto funeral home on Tuesday to remember an 83-year-old woman who was among the 10 people killed in a van attack that shocked the city last week. 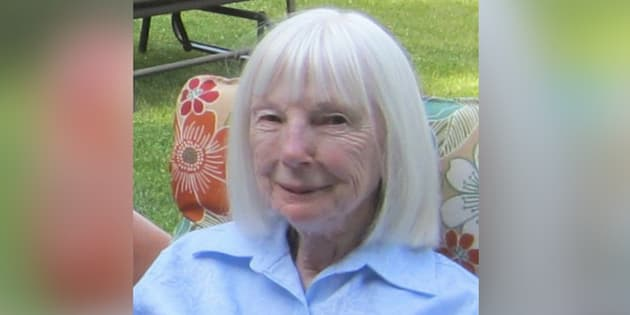 Geraldine Brady — Gerry to her friends — was remembered as an affectionate mother, grandmother and great-grandmother, who was willing to welcome anyone into her home as though they were family. "She was one of my favourite people to hug," her eldest granddaughter, Jennifer, said at the service. "I will miss how she would grip you tight while giving you a loud smacking kiss right by your ear." Brady, who sold Avon products for more than 45 years and was still going out to visit customers up until her death, was among those hit when a rental van mounted a sidewalk along a bustling street last week and ran down pedestrians in its path. Her funeral saw well-wishers pack the large chapel of the funeral home and spill into temporary seating at the back of the room. Photos of Brady, and a brightly coloured urn were set up at the front of the room, flanked on either side by large wreaths. In the crowd were four strangers who had been with Brady in the moments after the van attack, her family said. The two men and two women had turned up to the service unexpectedly, Brady's daughter, Janice, told mourners. At her urging, they stood up during the service and were met with applause. "We would like to say thank you very much," Brady's daughter said. "We know that our mother was not alone. And it took a lot of strength for them to come and talk to us today." The family also expressed their gratitude for all those who had helped them in the days since the April 23 attack. "We would like to thank everyone for their unconditional support in what has been a very difficult time for our family, our friends and our entire community," Brady's daughter said in her eulogy. Mourners outside the funeral for arrive for the funeral of Geraldine Brady in Toronto on May 1, 2018. Tuesday's ceremony closed with a recording of "My Favourite Things," from the film, "The Sound of Music." A favourite of Brady's, according to the family, the song's first few notes elicited knowing laughter from the gathering. Earlier in the day, a funeral for Dorothy Sewell, 80, who also died in the van attack, was held at the same chapel. "To Dorothy the cup was always full," an obituary for Dorothy Sewell, a victim of the van attack in north Toronto, reads. Sewell's service was private but mourners could be seen gathering outside the funeral home, where a flag flew at half mast, before the ceremony while others signed a book of condolences just inside the lobby. Another victim of the van attack was laid to rest days earlier. Loved ones held a private funeral for Munir Najjar at a Toronto church on Sunday. The 85-year-old Jordanian man was in town to visit family when he was killed. "The family wished it to be private, so we did not invite everybody,'' said Harry Malawi, president of the Canadian Jordanian Society, who described the service as "heartwarming." "After this horrible tragedy, it eased the pain,'' he said of the funeral and a public vigil for the 10 victims that followed it hours later. The family plans to repatriate Najjar's body to Jordan, Malawi said. A funeral for Anne Marie D'Amico, who also lost her life last week's attack, is planned for Wednesday. Sixteen people were also injured in the van attack that took place in the city's Yonge Street and Finch Avenue area. Two large makeshift memorials have sprung up where people were struck, with flowers, candles and messages in multiple languages.